I Make My Own Halloween Face Paint. No, Really. I wouldn’t say having a kid with asthma has a whole lot of advantages. Plus, I’m less a silver lining kind of woman than I am a glass-is-half-nothing-because-it-is-bone-dry one. Every so often, though, I do step out of my cloud of pessimism and Why My Kid? mode to feel a bit of gratitude for lessons learned through parenting my Asthma Girl. Yeah, I have grown in this experience. I have learned and I keep on learning. Actually, I’m being sincere. My family has practiced green living for quite some time, and it’s all because of Asthma Girl. You see, when her health was so poor I did everything possible to eliminate toxins that would come into contact with her. By necessity, that meant everyone in our family had to go green. We made the switch to organic and whole foods, all-natural DIY household cleaners, heavy recycling, and the like. No one knows precisely what causes asthma, although researchers have a few good ideas. I figured, though, that exposure to toxins certainly can’t help her asthma, or the rest of my family’s health. That’s why I do things like mix up my own face paint for the girls’ Halloween costumes. 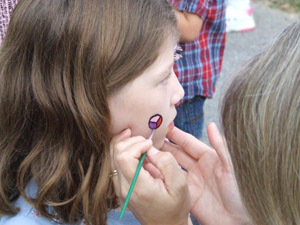 Yes, it’s kind of a crunchy granola mom thing to do and yes, face paint is listed as “non-toxic.” But “non-toxic” does not equal “natural,” and it’s easy to do. Plus messy, so the girls love helping. Plus cheaper and more customizable. Check it out. Mix together, and add a few drops of natural food coloring for other colors. Use Vaseline under the makeup because the food coloring in it will stain skin and clothing. Add a few drops of natural red food coloring to chocolate syrup. Mix glitter into pure aloe vera gel for instant body glitter. See? What’s easier than that? does the face paint clog pores?? You know, I’m not really sure. I use it on my kids, and they have that young skin that doesn’t break out (except for my little one’s eczema, which led to this project in the first place). The paint never caused any blemishes on them, but I’ve never used it on me. I’m guessing the shortening probably would clog pores. My Mom has eczema and lanolin allergies. Her dermatologist suggested she use crisco on her skin every night. She never once broke out. I don’t if she ever put it on her face though. She still uses crisco at night before bed especially in the winter. Hi, im faatyma thanks for your help its so much cheaper and fun to use, im not a mum but i use this on my little siblings, cousins and their friends on birthday parties. Im only 15 years old but i love children and i cant wait until i hold my own baby in my hands. I hope your little girl gets better and its nice to know that your whole family sacrificed an eating and life changing habit because of her. Anyway, im off to make pink and purple paint its my baby sisters birthday tomorrow and im turning her into the princess for the day! I wanted to ask something.. how long does this paint last? should i make it a day before or on the same day.